The Moultrie D555i edges out of its competition with its exciting features that will up the level of your next trail adventures. This wide angle game camera has features that are both functional and innovative. Most importantly, this comes at a reasonable price that will not put a hole in your wallet. With an 8 MP camera resolution, this trail camera takes HD video footages as well as high resolution images. It also has a variety of programmable options that you choose, adding a whole new dimension to your scouting experience. 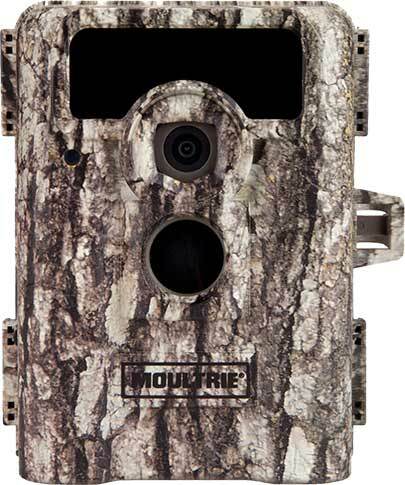 The Moultrie D-555i has 90 degree wide angle view, motion freeze technology and 16:9 widescreen videos and images. For less than $120, this camera is a great companion for your hunting and scouting activities during the peak season. These will help you successfully monitor food plots and wildlife patterns. Aside from the wide angle view, this camera also has a “fish-eye” field of view. This is a good option as it covers twice as much area in just a single camera. This is highly preferred by many hunters because of its coverage. An excellent feature of this camera is the no glow infrared flash. This feature is really great as it prevents the camera from being noticed by burglars and trespassers as well as scaring away and disturbing the animals in the vicinity. Along with the Illumi-night sensors, the no glow infrared flash enables the camera to produce brighter and clearer night pictures. This low glo game camera takes 6 C batteries, but is still smaller than many of its competitors. My brother-in-law tested his D555i in his front yard. It was taking up to 3000 frames per week, and after two months, the battery was still showing more than 70%. That is impressive! Do keep in mind that your battery life will largely depend on the number of pictures you take. One person might put his game camera up in a secluded spot where there is little to no movement, where another might put theirs up where there are leaves and branches constantly moving. It sounds obvious, but the more pictures your cam takes, the shorter your battery life will be. TIP: Set the D555i to take 3 snaps instead of 10, saving you plenty of battery life. Although there are minor setbacks of this camera, these are covered up by all the features that it offers. One really good thing about the Moultrie D-555i is that it is very lightweight and packable which makes it a lot easier to carry when you are backpacking or hiking. Plus, Moultrie is a brand known for its durability so you can expect this camera to last for years. In conclusion, the Moultrie D-555i is a camera that you get more value than what you pay for. It is packed with functional features but is not expensive unlike many other cameras. This surely will not disappoint.